Her smile lights up the room as she greets visitors to her Delran home. Visits, she says, from “all the nice people from Samaritan” who come on various days of the week have insured she’s never lonely! Not only does Ruby Coles relish their company, but the good care that is allowing her to preserve her independence. “I like the neighborhood I live in and would hate to be a burden to my children,” she explains. There’s Ajallatu (AJ) Turay, CHHA, her Samaritan home health aide, who cheerfully helps her with light housework and changing the bed linens. And Theresa Luebkemann, RN and Barbara Gould, LPN, “who take my blood pressure, order my meds and ask me 50,000 questions each time they’re here about how I’m doing,” she says with a twinkle in her eye. Joan Ordille, MSW, LSW, Ruby’s social worker, has taken over inquiries into several outstanding pre-hospice medical bills and her electricity bill that had risen drastically due to her need for oxygen and air-conditioning. “She was able to get me credits, discounts or a payment plan on these matters that just took the worry right off my shoulders,” said Ruby. 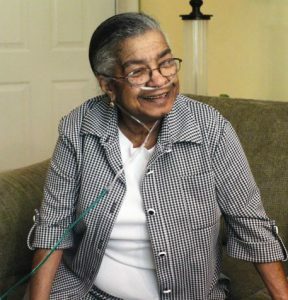 Ruby’s pulmonologist recommended hospice care when her advanced lung condition made her unable to withstand curative surgeries for a heart blockage and kidney stones. “At first, I was afraid of hospice. Like many people, I thought, ‘What are they trying to do, put me in the ground too early?’ But my doctor took the time to explain to me that Samaritan could help me at this stage of my illness. I’m glad I listened. ”Ruby was so surprised last November when she received a lovely Thanksgiving basket delivered by a Samaritan volunteer – part of the organization’s annual “Giving Thanks, Preserving Memories” project made possible by an anonymous donor. “It was so nice to be remembered,” she said. “If I wasn’t so sick, I would want to volunteer for Samaritan myself! ”Ruby looks back on her life with great gratitude and pride. The 81-year-old native New Yorker is the mother of two and the grandmother of four “and they’ve all turned out to be good human beings.” She enjoyed a long happy marriage to Lawrence Coles, a “nice, soft-spoken trackman for the Long Island Railroad who bought me jewelry whenever I got mad,” she laughed. Before her 1995 retirement, she broke the color barrier at her first job. “I learned several years after I started working at the New York headquarters for a national not-for-profit organization that they had called a meeting and asked ‘Would you mind if a colored girl works with us?’” By the time Ruby found out about the meeting, however, her hard work and friendly personality had been thoroughly embraced by the staff. She went on to work in the circulation departments of prestigious organizations including the National Association of Social Work, Law & Order Magazine, the Society of Mining Engineers and Smithsonian Magazine. The coincidence is not lost on Ruby that she once assisted social workers in ordering educational materials and now Joan, her Samaritan social worker, is using her training to help Ruby. Despite the severity of her illness, Ruby finds hope in looking ahead. When her oldest grandson got married two years ago, she felt “like a queen as I walked down the aisle in my beautiful gown.